Father’s Day was non-stop here. Kevin and Roy mowed lawns, I did 3.25 miles on the treadmill, got cleaned up and picked up a Jimmy John’s sandwich platter for lunch. After lunch, Kevin, Roy and the boys went swimming at our rental house. For those of you just tuning in, Roy is Kevin’s uncle (his grandmother adopted him) and he lives in our rental house across the street. Kevin’s grandmother died in 2008 (?) and Kevin and his mom are Roy’s co-guardians. I wouldn’t say the rest of Kevin’s family wrote him off, but they don’t have a lot of interaction with Roy, Kevin is fully responsible for him, though Kevin’s mom does help out when needed. Roy lived with Kevin’s parents for the first five years after Kevin’s grandmother died and the relationship became strained – plus, Kevin’s parents are getting up there in age and simply can’t watch/take care of Roy anymore – so the responsibility lies with Kevin. How do I feel about it? I’m a little resentful, I’ll be honest. I admire the hell out of Kevin for stepping up and taking on that responsibility, but I resent the fact that Roy has become part of our immediate family – the boys moved out, and Roy moved in, in essence. Yes, I realize this makes me sound cold hearted and you would be correct in assuming that, I am a bit cold hearted – I really don’t want to be in this position, but then I immediately feel guilty for thinking that because if Kevin hadn’t stepped in and taken over Roy’s care, he would be in a home right now. I have a lot of guilt for feeling this way. But the situation really turned out for the best. We firmly believe God had a plan for us when the woman across the street passed away and her home went up for auction. And Kevin was curious, so we attended her estate sale. I remember feeling so, SO sad walking through her house and seeing all of her possessions laying around for people to nit-pick over. I remember feeling angry that there were people who would turn their noses up at her stuff, stuff that she was proud to have, took care, held memories for her. And I remember feeling FURIOUS that Kevin bid on the house. Luckily, he lost the bid. I was relieved. But again, God had a plan and one month later, the guy who bought the house contacted Kevin and asked him if he wanted to buy it – he said yes. It was my birthday. Happy birthday to me, here’s a rental house. 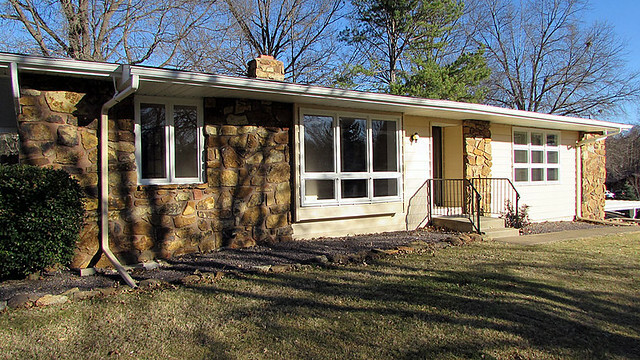 We took out a home-equity loan against our house and fixed the rental house up. 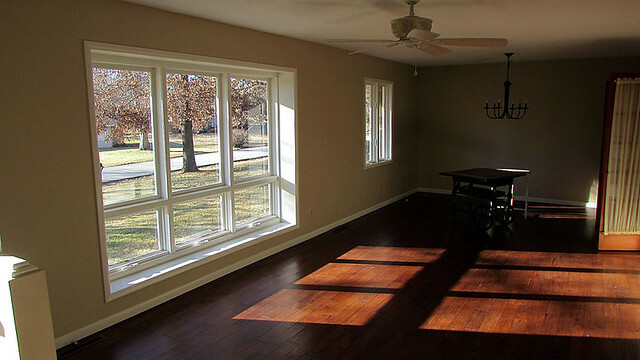 We tore up the carpets and put in hardwood floors. 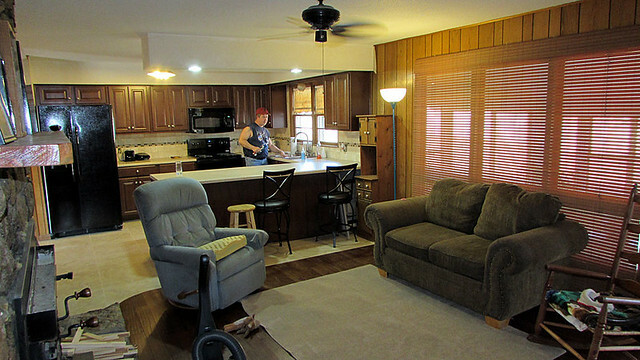 We completely remodeled the kitchen and put in all new appliances. We painted and fixed up the landscape. We got the pool up and running for about $600 even though “the experts” told us it would take about $12,000 to get it working properly. And by “we” I mean Kevin. Kevin is a master of all trades and quite talented in figuring things out. He did a fantastic job of fixing that house up. Shortly after fixing it up, Roy’s relationship with Kevin’s parents went south. And Kevin had an idea – why don’t we ask Roy to move? He would pay us rent, Kevin would be able to keep an eye on him and someone we knew would be living there. And then Kevin got another brilliant idea – why not move my office into the front part of the house and Roy would live in the back part of the house. Oh. And how about turning the basement into a music studio for his band to use for practice? I’m telling you guys, I’m married to a genius. So that’s Roy’s story in a nutshell. And Kevin is usually at the rental house more than he is at our house, but that’s okay, it gives me a chance to do what I want to do and Kevin has his space. So the guys are swimming at the house. I don’t swim over there. I never have and I never will. I will not be caught dead in a swim suit in front of Roy. It just feels ……………. icky. So I went to the mall. And while there, I returned this dress to Old Navy. I wanted to like it, I did like it, my body, however, had other ideas. And yes, I’m on the endless, frustrating cycle of trying to find clothes that will look good on me and keep me cool when we go to Bermuda. (Yes – we booked the vacation). I also went to Bath and Body Works to pick up some body lotion because momma loves her some body lotion. And then I picked up the cookie cake that you see above. 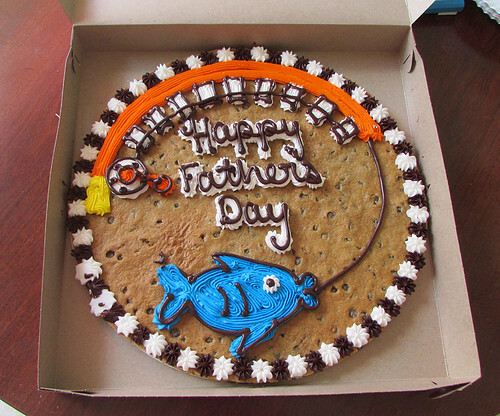 We don’t DO cakes in our family – it’s always cookie cakes. 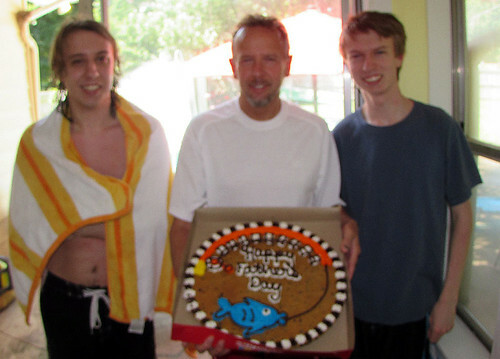 I took it over to the rental house and the guys were ready to take a break from swimming and sugar up. The fact that this is blurry makes me angry – stupid camera. The guys lounged around a bit more after cookie cake, some more than others…. and then we all five, me, Kevin, the boys and Roy, all played Lords of Waterdeep. It’s a Dungeon’s and Dragon’s board game – yes, we ARE that cool. It’s a super fun strategy game and we will be playing that more often. The boys really enjoyed themselves. He had his eye on these the other day when we were shopping for me for (more) sneakers for work but he didn’t end up buying them. I went back later and got them for him because I knew he would never buy them himself. Cool sneaks for a cool man. It was a crazy, busy day but I think Kevin and the boys had a good time. He’s seriously one of the most awesome men/fathers and we are very blessed to have him in our lives. We moved Roy into the house on Saturday. It was … fun … ish. The house needed a good cleaning though. It’s been vacant for a little over a year and with all the construction that we’ve had done and Kevin’s projects that he’s been working on, it was a giant dust storm. (In fact, when I got done cleaning the wood floors – which nearly the entire house is wood floors, I was actually wheezing). Then Blake helped me move his tubs of clothes over to the house and Kevin went over to his parent’s house with Roy to get the rest of his stuff. Two truck loads later (no seriously – TWO truck loads), we finally have all of his stuff moved in. And the place is JUNKED up. I know people do what’s necessary to cope with stressful situations. I get that. However, it annoys me to no end that Roy’s caregivers didn’t see, or plan, for the bigger picture. Instead of allowing him to spend money on superficial, spur-of-the-moment and rash desires (I think he has five remote cars, one violin, a drum set and countless video game systems) in order to entertain and appease him into submission, why didn’t Roy’s caregivers start a hope chest for him. Like a bedroom set. Living room furniture. Kitchen gadgets and appliances. Items he could store away in his “hope chest” so that WHEN he moved out (because come on – it HAD to happen one day, one way or another), he would be better equipped to start his new life. Instead, when we moved him into his house, he had nothing. Nothing. Not even his own bed. And being the middle of the month, and several hundred dollars poorer (not sure where that money went, quite frankly), he’s starting out with the barest of bare essentials. We ended up buying him a $100 bed frame. It’s rickety and sheer plywood, but it’s a bed. 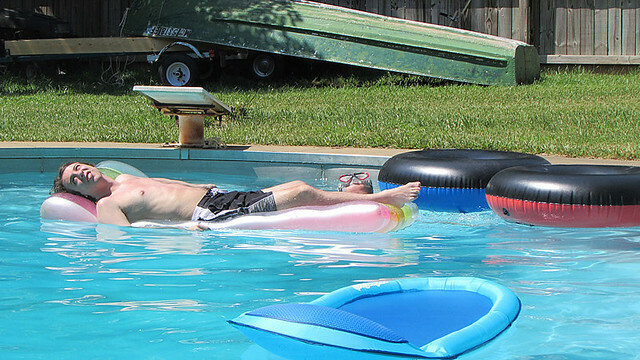 He didn’t have enough money to buy a mattress, so we ended up buying him an air mattress. And he’ll likely have to sleep on it for several months because we’ve already budgeted his money out a few months and he has upcoming expenses that he won’t be able to get out of, unfortunately. He doesn’t have anyplace to put his clothes, so he’s quite literally living out of plastic tubs, for now. He does have his own TV and plenty of entertainment, OF COURSE, and his own recliner that actually belonged to his mom (Kevin’s grandmother). He also got her dishes and towels, so there’s that. We bought him super cheap (like you can actually bend it with your hands) cookie sheets, silverware, kitchen gadgets, toaster and pots and pans. (The pots and pans are so small, like almost look like they belong to a doll, but they will work for now since it’s only him). He already had a George Foreman grill and a toaster oven, which he’s okay using. We’re not sure he can handle a full-blown oven yet. And I’m not sure we feel comfortable with him trying. So, he’s not to use the oven, for now. Of course, the house has a microwave and a fridge, so there’s that. I can assure you, Kevin now has full control of his money and will make every dollar count because Roy is going to need every dime in order to make a life for himself. No more brainless purchases. We counselled Roy and told him when it comes to money, bills first, needs second, wants third. Period. That’s how life works. So what the heck was the two truck loads of stuff, you ask? Good question. We haven’t had time to go through it yet. But just Kevin’s initial survey? It looks like we will be donating a bunch of stuff to the Goodwill and/or filling a dumpster. Roy has his dog. Who is 11 years old and not getting around very well. She belonged to his mom (Kevin’s grandmother) and she has several teeth that are rotting away. They made an appointment for her to see a vet the beginning of next month (government payday) and Kevin found out how much that is going to cost: $320 – they will have to put her to sleep and pull several teeth. And they also cautioned that since she’s so old, she may not even survive the procedure. So … Roy has the emotional stress of not knowing if his dog will survive another month or not. This poor kid (I call him a kid, but he’s 44 [?] – a kid in a man’s body) has been through so much in his lifetime. I found out some pretty shocking news about his birth mom – Roy told me himself. I never knew his family history and I won’t repeat it here. Suffice it to say, NO ONE should have to go through life with the crap that Roy has had to go through. I think that’s another reason Kevin and I are so determined to help him – we just feel sorry for the guy. I’m a little annoyed with Kevin’s family, to be frank. I feel like everyone is just waiting to write Roy off. No one offered to help move him into his own house, no offers to periodically bring him food – complete silence. (What the hell??) Granted, we have no idea if Roy will be able to handle living on his own, but at least this way, we can say that we tried it. This is a trial run for Roy. We’re hoping he’s able to handle it, and himself, and if/when the time comes that his parents want to move into the house, Roy will be used to living on his own and will prove that he CAN live on his own, so we can move him into a nearby duplex or apartment. If Roy can not live on his own, then we will have to look at a housing program for him. Which, in some ways, may be better for him because at least this way he will have people around him and can make friends. Roy has lots of acquaintances. He is the most sociable, and likable quite frankly, person that I know. He has no qualms walking up to people and striking up a conversation. (Which is both a good and bad thing). But friends/friends? I’m not sure. He goes to church every Sunday (Kevin has been taking him) and he has friends there. We sort of have a standing joke that people are always saying “Hi Roy!” to him wherever we go. He seems to know EVERYONE. But I don’t know how “close” these “friendships” are, you know? I think people are just being nice to him because of his mental condition. I don’t know that Roy has ever been close to anyone outside of Kevin’s grandmother. So maybe a home would be good for him in that aspect. But I’m getting ahead of myself. We’re in trial mode now. We’ll just have to see how he does and hope he doesn’t hurt himself or burn the house down. At least, I HOPE it’s temporary. Kevin has a special-needs uncle – let’s call him Roy. His grandmother adopted him out of foster care when he was a toddler. I guess, technically, he’s not really special needs. He’s not retarded but rather, just slow. His birth mother drank and probably did drugs when she was pregnant with him which caused brain damage. He’s only a few years younger than myself. Kevin’s grandmother passed away and he’s been living with Kevin’s parents all of these years. However – Kevin’s parents are getting older and it’s harder for them to get around and quite honestly, they just want to live their remaining years peacefully. The situation has become tense and Kevin became his co-guardian – he’s now fully (or will be when his mother passes away) responsible for him. We knew, at some point, he would need to get out on his own, learn to be independent. The challenge? He can’t really be by himself. He has no concept of money. He will never drive. And he doesn’t always have common sense when it comes to some things. So he will need frequent supervision. Our plan was to get him moved into an apartment and the family would take turns dropping by to check on him – take him meals once in a while, etc. I came up with the plan of moving him into our rental house across the street. He would pay us rent and we could keep a close eye on him. (He gets money from the government every month due to his disability and might I just add – THIS IS WHAT GOVERNMENT PROGRAMS WERE MEANT TO DO: to help those that can’t fully help themselves. NOT SUPPORT PEOPLE WHO ARE MENTALLY AND PHYSICALLY CAPABLE OF WORKING. *ahem* Focus Karen, focus). No one is currently living in the house now and we need to get someone in there so we can start paying down our loan. Kevin originally bought the house with his parents in mind and they are still welcome to move in, as soon as they sell their house. The problem? Who knows when that will be. It could be months. It could be years. In the meantime, Roy can live there and we’ll come up with another solution if/when his parents sell their house and/if they still want to move in when that happens. We talked about this plan and he was going to present this plan to his parents after bowling with Roy. Things sort of reached a breaking point on Sunday night. Kevin left to go bowling with Roy and was gone for several hours. He was gone so long, I started to become worried about him. When he finally came home, he had Roy with him. He felt like the situation was getting worse and why wait? Our plan is happening now. The problem is – Kevin didn’t do this gradually so Roy doesn’t have any of his stuff moved into the house yet. So, he’s living with us until we can move him into the house. I’m sure we’re still going to have to “introduce” him slowly to being in the house and living on his own. I’m going to try and talk the boys into spending a few nights with him at the rental house so he doesn’t get scared being on his own. Plus – it’s always a little spooky spending the night in a new place. But it’s time. Kevin’s parents won’t live forever and no one in the family really wants him to live with them. And to be perfectly honest, Roy is mentally capable of living on his own, he just hasn’t up to this point. There has always been someone to baby him and look after him. And he won’t be “alone” per se, the family will still be available and did I mention we’ll be across the street if he needs anything? I think it’s a win-win for everyone, quite frankly. This is going to be quite an adjustment on everyone’s parts. I think this will actually be good for Blake. He has always had a special connection to Roy – Kevin’s grandma watched Blake when he was a baby so I could continue to work and Blake and Roy have sort of grown up together. They are pretty close. For example, right now, Blake is watching TV with Roy and I can’t tell you the last time Blake came out of his room to watch TV. I think he feels like he needs to take care of Roy and that might be a good thing in the long run for Blake. Roy gives him purpose. He feels comfortable around him and he’s the most animated whenever he’s around him. Again, a win-win situation. Stay tuned … we’re turning the page to another chapter in our lives.